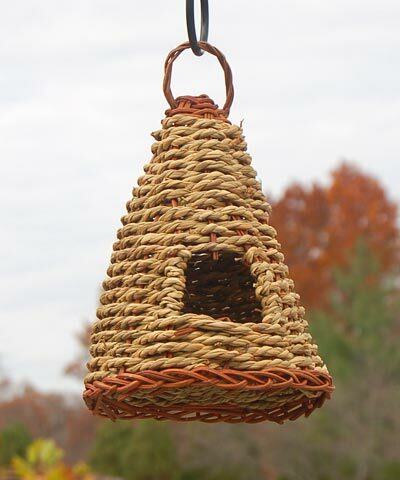 Invite a bevy of birds to nest in your area using the Gardman Woven Rope Hive Roosting Pockets. These nature-inspired roosts bring a fantastic look to your sanctuary, thanks to their rope construction and brown tones. This club package of 25 individual shelters is wonderful for a scout project, or for starting a birding area at a park. The circular base on each piece creates plenty of room for your feathered friends, and the 2" wide and 1.75" tall opening allows them to enter it easily. Wooden rods create a hardy and natural frame, and the rope body weaves in and out of these sticks to form the floor, sides, and roof. This woven construction helps keep the home ventilated, and enables any captured water to exit the nest. A twig loop at the pointed top makes hanging the item simple, and the small size is perfect for a chickadee or wren family. Help bird populations thrive by offering them nesting spots with these Woven Rope Hive Roosting Pockets. Note: This case pack includes 25 of the Gardman Woven Rope Hive Roosting Pockets.